The snow lies heavy but the new daylight dazzles! Spring is ... trying. What's been going on in groups? The Communications group is reading The Phantom Tollbooth and being mightily inspired (in our own writing) with how Norton Juster plays with language. 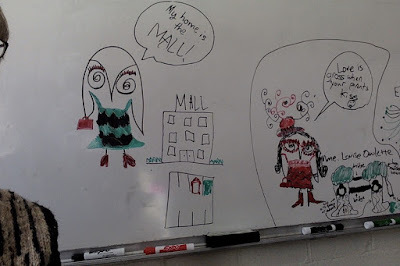 The group has also provided great feedback to a middle grade chapter book I am writing and drawing. Such editors! Our conversations about plot and character seem very real. Before School Writing Club, Philosophy Club, and a Wrinkle in Time group round out my 4th grade involvement. I visit 2nd grade rooms during "Second Grade Hour," focusing on literacy, and also often collaborating with Chaké Higgison on literacy with art extensions. From our museum visits to mix-n-match flipbooks, the emphasis is on making note of DETAILS. I visit each 3rd grade room weekly, to offer open-ended writing and verbal thinking challenges. This means I have a large number of third grade penpals! With second grade teacher Carli Page-Redmann, I am also about to spearhead a drive on behalf of the amazing bookfairy pantry project. After all, the soul can starve as surely as the body! More on that soon. Some fifth graders have compiled the results of the survey they sent out on behalf of our Poem Booth. Many (122!) responded. Do you know what the most poetic season is considered to be? Word? Place? Number? Analyzing this, particularly in poetry form, is fun. We are about to start that annual project, The Insider's Guide to HMS (written by 5th graders for future 5th graders). The Communications kids not only write articles but also serve as editors for incoming articles. 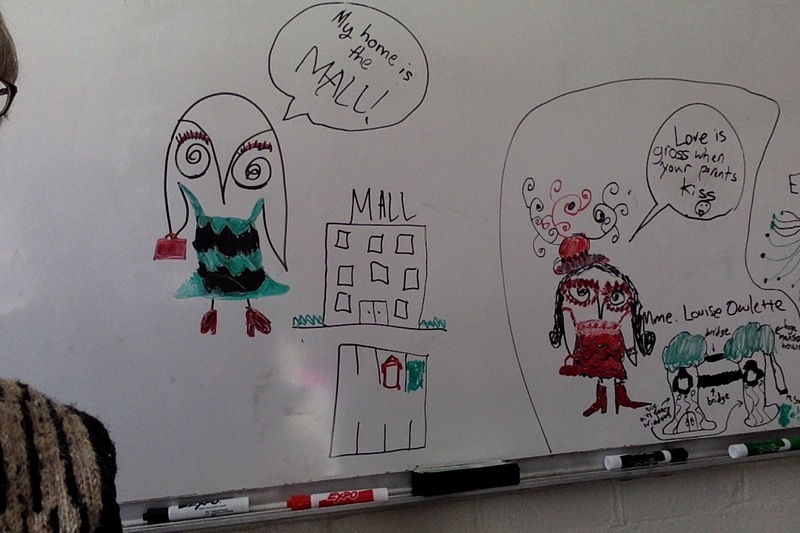 The sixth graders are deep into culture research. Different cultures do things so differently. Why? And can a cultural lens be applied to investigating literary genres, for example: SciFi? We read an article from The Economist's sister magazine, 1843, called Folding Meanings. How do young Chinese writers use science fiction to criticize aspects of their society? Why do they do this? What is censorship? Seventh graders are nearing the end of Hesse's Witness (see last blogpost). This is the first year I've read this book during which I've brought in local articles about current KKK activity for us to discuss. The work feels extra meaningful. What is racism? WHY? How do people's minds open and close? 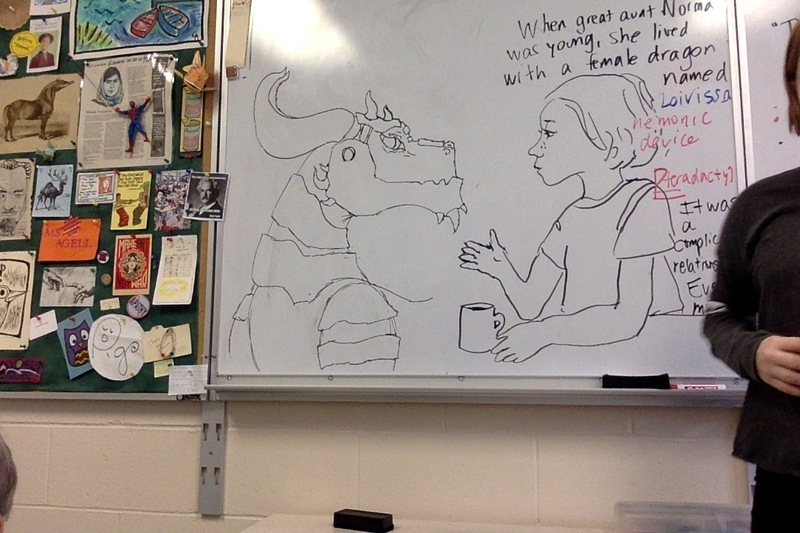 Besides finishing up Godless (see last blogpost), 8th graders have been serving as adjunct editorial staff for our literary magazine, reading and rating submissions (and there are a LOT of them). Next up: students write parody, compose sonnets, and soon enough the 8th Grade Civil Rights unit will bring us plenty of opportunity for extensions. 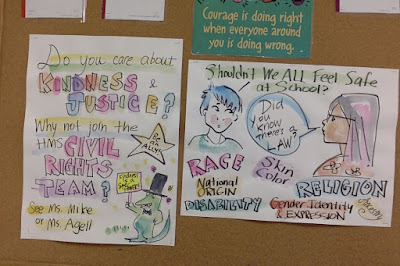 It's an honor to be co-facilitator of the HMS Civil Rights Team. The HMS blog has charted some of CRT efforts, including a "labels" activity. What does calling someone a name say about the name caller? Fifth and Sixth Grade Writing Clubs continue to meet monthly. Student writers from any HMS grade are encouraged to see me after school on (most) Wednesdays, if they would like 1:1 time. On a final note, it was gratifying to attend the annual Scholastic Writing Awards night at which HMS had a strong showing. I feel so fortunate to work in a district that so promotes writing.